For blue-eyed-blond-haired girls and women, makeup is a fun way to enhance features of the face and emphasize natural beauty. Although there isn't a "rule of thumb" when it comes to makeup, those with blond hair and blue eyes generally should choose colors, tones and products that suit and complement their coloring. Typically, those with blue eyes and blond hair are either fair-skinned or more "tanned"/medium-skinned. The shade of hair varies as well as the color of the eyes, but in most cases, makeup shades and products recommended are suitable for all. You should slightly tweak colors depending on how warm or cool your skin tone is. For cooler skin tones and platinum blonds -- blue, pink and purple eye shadow looks best. If you have a warmer skin tone and are more of a yellow-blond -- browns, greens and golds look striking. Don't be afraid to play around. 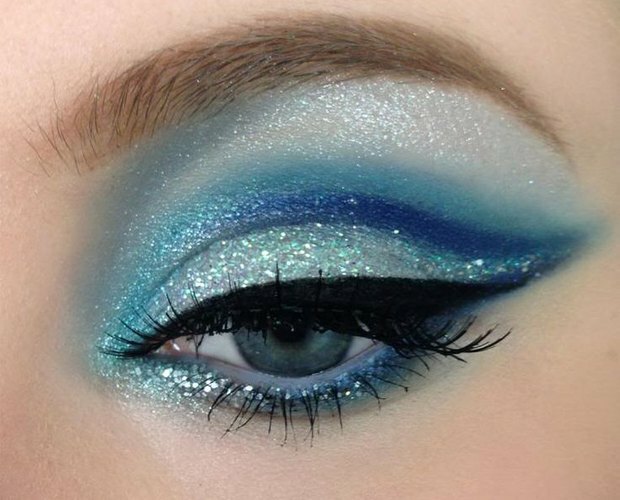 Metallic eye shadow is universally flattering for those with blond hair and blue eyes. If you have darker, warmer-toned skin, you can use slightly deeper, darker and warmer tones like orange, copper and bronze to emphasize features. If you're working with lighter, cooler-toned skin -- jewel-toned purples, soft or smoky pinks and aqua blues are flattering but in light washes of color. Lighter shades of blond hair put emphasis on the eyes so be sure not to use dark shades, which can overwhelm your features. Try a soft pink eye shadow all over the lid and sweep a deeper shade of purple into the crease for definition. Blend softly in circular motions up toward the brow bone and toward the outer corner of the eye using a small and rounded, fluffy eye shadow brush. Cream eye shadow formulas create a glossy finish, which looks even more natural but can also give that "blond bombshell" look. Eyeliner gives eyes definition, but black can sometimes be a little too dramatic for everyday or daytime wear. Try a soft brown instead. Apply the eyeliner opaquely or smudge it out with an angled eyeliner brush or cotton-tipped swab using small strokes. While SPF is recommended for everyone, those with fair skin are at an even higher risk of exposure to the damaging effects of the sun. It doesn't hurt to look for a foundation that contains SPF. If your foundation does not include SPF, use sunscreen after moisturizer or apply a moisturizer that contains SPF. For cool blonds with fair skin, peach and/or pink-based foundations are best. For warm blonds and medium/tan skin, shades of beige are a good match. Choose a shade that's as close to your natural skin tone as possible. Formula depends on skin type so if you're oily, choose a powder/mineral foundation that's oil-free and matte. If you're dry, opt for a liquid foundation that's hydrating with a natural finish. Peach and pink flushes of blush on the cheeks are the most complementing shades for both cool and warm skin tones. Coral and apricot brighten warmer skin tones as well. Bronzer should be applied with a light hand to the areas of the face that the sun would naturally "kiss" --forehead, cheeks, chin and nose. Don't forget to bring down the neck and chest, too. Bronzers are usually warm-toned unless used for contouring, so choose a soft, matte, brown shade. Apply both blush and bronzer in controlled, circular movements back toward the hairline. Your choices for lip color are endless because blond-haired, blue-eyed beauties look fierce in any shade of lipstick. However, reds, pinks and corals are most flattering, but that varies depending on skin tone. If your skin is quite pale try a bright pink or vibrant red. If you're a little more tanned don't be scared to sport a glossy apricot or coral kisser. Based in the GTA, Canada, Shayah Georgakopoulos has more than four years of cosmetics experience. She has attended numerous training schools pertaining to makeup and skincare and has also received certification through seminars and online e-courses. Shayah has been writing beauty-related articles since 2013 and hosts and writes for her own blog as well. What Color Clothes Should a Brunette Wear?